In an unusual move, the Vatican newspaper has published an essay responding directly to concerns raised by the traditionalist Society of St. Pius X (SSPX). The piece, titled “On Adhesion to the Second Vatican Council,” appeared in the L’Osservatore Romano (L’OR) section of the Vatican’s online news portal on December 1, and it deals with one of the most troublesome points in the Holy See’s dialogue with the formerly schismatic society of priests. The SSPX broke from full communion with the Church in 1988 when its head, the late Archbishop Marcel Lefebvre, acted against the instructions of Pope John Paul II and ordained the four bishops who currently lead it. The SSPX argued that this action was necessary because of a crisis in the Catholic Church brought on in part by statements made by the Second Vatican Council (1962-1965). Since his election to the papacy, Benedict XVI has sought to heal the situation by allowing broader use of the traditional Latin Mass (one of the group’s key demands) and lifting the excommunications that the four bishops leading the organization had incurred when they were ordained in 1988. He also gave the Congregation for the Doctrine of the Faith (CDF) the task of continuing a dialogue with the priestly society to resolve doctrinal concerns and, hopefully, clear the way for the SSPX’s full rehabilitation. By some accounts, this document is an explanation of the way in which the Church’s profession of faith is to be understood in light of traditionalist concerns. The SSPX leadership would be asked to make the profession of faith—which includes the Nicene Creed and a few additional paragraphs—in view of the doctrinal preamble. The preamble’s contents are not known, though at the end of November, Bishop Bernard Fellay—the head of the SSPX—stated that the group could not accept the doctrinal preamble as it was written, but that they would ask the Holy See for modifications that would allow them to agree to it. He also indicated that the SSPX will release the doctrinal preamble or a revised version of it, if the CDF agrees to one. Why did L’Osservatore Romano publish now? Almost immediately afterward Bishop Fellay’s remarks, L’OR published its essay responding to traditionalist concerns. Though not naming the SSPX specifically, the piece sheds light on the CDF dialogue with the group, and it was clearly written by someone familiar with the discussions. Although the online version of the document was anonymous, it is reportedly the work of Msgr. Federico Ocariz, the vicar general of Opus Dei and one of the theological experts involved in the CDF’s dialogue. But why was the essay published now? With the delicacy of the situation, the Holy See would not want to provoke the SSPX. It is possible the Holy See felt that, following public statements by the SSPX, it needed to get its own perspective out there. It is also possible that L’OR requested the essay in fulfillment of its recent mandate to publish more engaging material (a mandate it has previously sought to fulfill by publishing appreciative pieces on the Beatles, Michael Jackson, and Homer Simpson). It adds that it is “useful to review it in its essential points, given the persistence—also in public opinion—of misunderstandings regarding the continuity of some Conciliar teachings with previous teachings of the Church’s Magisterium.” This might ruffle feathers in the traditionalist community, for it labels common traditionalist claims as persistent misunderstandings. The first traditionalist claim the essay discusses is the assertion that Vatican II was a “pastoral” council. This claim has been used to set aside certain things the Council said as being pastoral rather than doctrinally binding. First of all, it is not pointless to recall that the pastoral motivation of the Council does not mean that it was not doctrinal—since all pastoral activity is necessarily based on doctrine. But, above all, it is important to emphasize that precisely because doctrine is aimed at salvation, the teaching of doctrine is an integral part of all pastoral work. Furthermore, within the Documents of the Council it is obvious that there are many strictly doctrinal teachings: on Divine Revelation, on the Church, etc. As Blessed John Paul II wrote: “With the help of God, the Council Fathers in four years of work were able to produce a considerable collection of doctrinal statements and pastoral norms which were presented to the whole Church” (Apostolic Constitution Fidei Depositum, 11 October 1992, Introduction). The Second Vatican Council did not define any dogma, in the sense that it proposed no doctrine with a definitive act. However, even if the Magisterium proposes a teaching without directly invoking the charism of infallibility, it does not follow that such a teaching is therefore to be considered “fallible”—in the sense that what is proposed is somehow a “provisional doctrine” or just an “authoritative opinion”. Every authentic expression of the Magisterium must be received for what it truly is: a teaching given by Pastors who, in the apostolic succession, speak with the “charism of truth” (Dei Verbum, n. 8), “endowed with the authority of Christ” (Lumen Gentium, n. 25), “and by the light of the Holy Spirit” (ibid.). This passage must be read carefully. It is clear that if the Magisterium does not teach a particular doctrine infallibly then it must, by inference, teach it “fallibly”—if it teaches it at all. The question is what is meant by “fallible” in such cases, and the essayist is quick to exclude two senses. The first is interpreting non-infallible teachings as merely “provisional doctrines” (Italian, “dottrina provvisoria“). He seems to envision teachings that are merely temporary or makeshift and might easily be changed. Whatever one might say about it, a teaching of the Magisterium should not be viewed as temporary or makeshift. The second sense interprets a non-infallible teaching as “just an ‘authoritative opinion’” (Italian, “autorevoli opinion“). He seems to envision an opinion that is authoritative in the sense that it is influential and has official standing, but which does not have a real claim on our inner adherence. Instead, he says, the teachings of the Magisterium must be received as teachings given by pastors who are divinely guided. This does not mean that the pastors are always infallible, but they are divinely guided even when they are not teaching infallibly, and so their teachings cannot be dismissed as merely temporary teachings or official opinions. Naturally not all the affirmations contained in the Conciliar documents have the same doctrinal value and therefore not all require the same degree of assent. The various levels of assent owed to doctrines proposed by the Magisterium were outlined in Vatican II’s Constitution Lumen Gentium (n. 25), and subsequently synthesized in the three clauses added to the Niceno-Constantinopolitan Creed in the formula of the Professio fidei published in 1989 by the Congregation for the Doctrine of the Faith and approved by Blessed John Paul II. Here the author mentions the profession of faith (Latin, professio fidei) discussed earlier. It consists of the Nicene Creed plus three additional paragraphs, the first of which begins, “With firm faith, I also believe…” (see the previous link for the full text). 1) The assent of theological faith, which is owed to those teachings that the Church has infallibly taught to be divinely revealed (“contained in the Word of God”). 2) Firm and definitive assent, which is owed to teachings regarding faith or morals that the Magisterium has infallibly taught but has not (or not yet) taught to be divinely revealed. 3) Religious submission of will and intellect, which is owed to non-infallible Magisterial teachings. For examples, see the Ratzinger-Bertone commentary. Those affirmations of the Second Vatican Council that recall truths of the faith naturally require the assent of theological faith, not because they were taught by this Council but because they have already been taught infallibly as such by the Church, either by a solemn judgment or by the ordinary and universal Magisterium. So also a full and definitive assent is required for the other doctrines set forth by the Second Vatican Council which have already been proposed by a previous definitive act of the Magisterium. The Council’s other doctrinal teachings require of the faithful a degree of assent called “religious submission of will and intellect”. Precisely because it is “religious” assent, such assent is not based purely on rational motives. This kind of adherence does not take the form of an act of faith. Rather, it is an act of obedience that is not merely disciplinary, but is well-rooted in our confidence in the divine assistance given to the Magisterium, and therefore “within the logic of faith and under the impulse of obedience to the faith” (Congregation for the Doctrine of the Faith, Instruction Donum Veritatis, 24 May 1990, n. 23). This reflects the fact, discussed earlier, that the pastors of the Church are divinely guided even when they are not speaking infallibly. Documents of the Magisterium may contain elements that are not exactly doctrinal—as is the case in the documents of the Second Vatican Council—elements whose nature is more or less circumstantial (descriptions of the state of a society, suggestions, exhortations, etc.). Such matters are received with respect and gratitude, but do not require an intellectual assent in the strictest sense (cf. Instruction Donum Veritatis, nn. 24-31). This is important because there are of statements in Vatican II (“descriptions of the state of a society, suggestions, exhortations, etc.”) that rub traditionalist sensibilities the wrong way. [A]n essential characteristic of the Magisterium is its continuity and consistency through history. Continuity does not mean an absence of development; down the centuries the Church deepens in her knowledge, in her understanding and, consequently, also in her Magisterial teaching of Catholic faith and morals. A number of innovations of a doctrinal nature are to be found in the documents of the Second Vatican Council: on the sacramental nature of the episcopate, on episcopal collegiality, on religious freedom, etc. The last, in particular, is a concern to traditionalists. These innovations in matters concerning faith or morals, not proposed with a definitive act, still require religious submission of intellect and will, even though some of them were and still are the object of controversy with regard to their continuity with earlier Magisterial teaching, or their compatibility with the tradition. The essayist thus places these in the third category of assent. But how should the controversy be resolved? In the face of such difficulties in understanding the continuity of certain Conciliar Teachings with the tradition, the Catholic attitude, having taken into account the unity of the Magisterium, is to seek a unitive interpretation in which the texts of the Second Vatican Council and the preceding Magisterial documents illuminate each other. Not only should the Second Vatican Council be interpreted in the light of previous Magisterial documents, but also some of these earlier Magisterial documents can be understood better in the light of the Second Vatican Council. Is this approach itself an innovation? This is nothing new in the history of the Church. It should be remembered, for example, that the meaning of important concepts adopted in the First Council of Nicaea in the formulation of the Trinitarian and Christological faith (hypóstasis, ousía), were greatly clarified by later Councils. The interpretation of the innovations taught by the Second Vatican Council must therefore reject, as Benedict XVI put it, “a hermeneutic of discontinuity and rupture,” while it must affirm the “hermeneutic of reform, of renewal within continuity” (Discourse, 22 December 2005). How does that shed light on the “innovations” of Vatican II that concern traditionalists? These are innovations in the sense that they explain new aspects which have not previously been formulated by the Magisterium, but which do not doctrinally contradict previous Magisterial documents. This is so even though, in certain cases–for example, concerning religious freedom–these innovations imply very different consequences at the level of historical decisions concerning juridical and political applications of the teaching, especially given the changes in historical and social conditions. The essayist—and by unofficial extension the CDF—thus seems to be taking the position that Vatican II’s teaching on religious liberty does not contradict the principles contained in prior Magisterial statements but rather adds to those principles and applies them in the context of the present social and political order. That’s how it wants the Council’s teaching on religious liberty squared with prior Magisterial statements. An authentic interpretation of Conciliar texts can only be made by the Magisterium of the Church herself. Therefore, in the theological work of the interpretation of passages in the Conciliar texts which arouse queries or seem to present difficulties, it is above all necessary to take into account the sense in which they have been interpreted in subsequent Magisterial interventions. almost half a century has passed since the conclusion of the Second Vatican Council and that in these decades four Roman Pontiffs have succeeded one another on the Chair of Peter. An assessment of the teaching of these Popes and the corresponding assent of the Episcopate to that teaching should transform a possible situation of difficulty into a serene and joyful acceptance of the Magisterium, the authentic interpreter of the doctrine of the faith. This must be possible and is to be hoped for, even if aspects that are not entirely understood remain. This is a direct appeal to the SSPX to view Vatican II in light of subsequent Magisterial developments and to have confidence that the conciliar statements they find troubling can be understood in harmony with the Church’s faith, even if not every question has been answered. [T]here remains space for legitimate theological freedom to explain in one way or in another how certain formulations present in the Conciliar texts do not contradict the Tradition and, therefore, to explain the correct meaning of some expressions contained in those passages…. [T]here remains legitimate room for theological freedom and for further opportune in-depth study. He thus directs the SSPX’s attention to how to resolve apparent discrepancies rather than trying to get Vatican II’s teachings set aside. It remains to be seen what the traditionalist response to the essay will be. The essay itself is noteworthy in that it provides a rare public glimpse into the private dialogue between the CDF and the SSPX. We will get another glimpse when the SSPX releases the doctrinal preamble. Interestingly, the L’OR essay does not try to solve the issues raised by the SSPX by invoking the guidelines for handling theological dissent that the CDF spelled out in the 1990 document Donum Veritatis. This is not surprising because the CDF is trying to heal a situation of dissent rather than institutionalizing it. Let’s pray that they succeed. 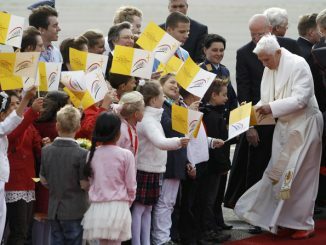 Below are some great photos from the Holy Father’s trip to Germany, all via Catholic News Service. Scroll all the way down for links to full texts of yesterday and today’s papal addresses.